How does the current Celtics team compare to those of the past half-century. Let's take a look. Frankly, the 60's teams, led by Bill Russell, were so powerful, watching the games was almost boring. Bill Sharman retired as a player in 1961, Bob Cousy left the team in the early 60's, and Tom Heinsohn departed in 1965. No problem. Red Auerbach fielded the first all African-American starting five consisting of Sam Jones, K.C. Jones, Willie Naulls, Tom Sanders and Russell, and the team kept winning. Auerbach stopped coaching and appointed Russ as player-coach. And the team kept winning. John Havlicek and Larry Siegfried were the key subs. The playoffs were normally far from exciting until Boston took on the Lakers in the Finals. The Auerbach/Russell duo was the key to it all, and it all worked. The 70's Big Three consisted of John Havlicek, Dave Cowens and Jo Jo White. 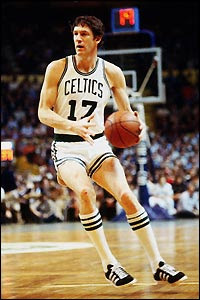 Havlicek was a hold-over from the 60's era and held down the fort for a year until Dave Cowens arrived via the draft. This was an undersized team that was thrilling to watch. White was 6'3", Havlicek at 6'5" and Cowens at 6'8.5", and they could handle anybody. Big Red defended Wilt Chamberlain and Kareem Abdul Jabbar (then Lew Alcindor) as well as any center in the league. The teams picked up two Championships in the decade. During intros, Jo Jo ran onto the court with a classic Philadelphia School Boy Shuffle, fired the ball like it was shot from a cannon and made many critical plays. Havlicek never stopped moving, both on offense and defense. He would wear out opponents at an ungodly clip and I loved to watch this team. Their triple-overtime win against the Suns in the 1976 Finals is rated as one of the best NBA games of all times. The 70's brought Larry Bird, Robert Parish and Kevin McHale, ably assisted by Nate Archibald (early 80's), Dennis Johnson, Danny Ainge and Cedric Maxwell. These guys were so good that even Bird admitted that, at times, they could do anything they wanted on the floor and it worked. The starting five were big and extremely talented. Ainge had no conscience when heaving up shots, and Larry was one of the top passing forwards ever. Kevin, with his height and super-long wingspan, would snag an offensive rebound, hold it high and out of reach and put the ball into the basket. Robert had a great rainbow jumper and fit nicely with the other team members. Dennis was a steadying influence, and Magic Johnson said he was one of the very toughest defenders he had to face. This group took three Championships in the decade. I am skipping the 90's because there was no Championship and Rick Pitino was here. There is a connection between the two highlighted factors. And the main Celtic from the 90's, Paul Pierce, finally got a well-deserved Championship in the next decade, so on to the 2000's. Danny Ainge wanted a Championship, so he constructed a team to get one. And get one they did. Paul Pierce, Kevin Garnett and Ray Allen, assisted by Rajon Rondo, got the job done. The Celtics had some fiery personalities here, and there were clashes at times between the players. But Paul Pierce and Kevin Garnett finally got their one-and-only trophy in 2008. Rondo was a ball-control guard, so we didn't see the ball movement we see with the present team. The Big Ticket directed the defense and did a great job with it. Paul was an offensive threat from anywhere on the floor, and no one could leave Ray alone. It worked, but only for one Championship. So how does the 2017-18 Celtics team measure up? Ainge brought together the Pierce/Garnett/Allen trio to possibly win a few Larry O'Brien Trophies. Danny is nothing if not ambitious. He wants a dynasty. Make no mistake. With 30 NBA teams, salary caps and wandering players, it is an almost-impossible task. Locking up several max, or near-max players and putting them with the right role players, while also mixing vets with young guys seems to be the key. Well, that is what this team appears to be. They are top-notch in defense and move the ball very well. No Rondo-like ball control. The offense needs work, but the stellar defense has brought them to the top of the League thus far. And they are balanced. No player needs to play Lebron-like minutes to succeed. For this season, they are on fire without one of their top-three players in Gordon Hayward. Imagine next year with him. They are winning and they are fun to watch. A dynasty? Maybe. Danny is the Master Builder and Brad Stevens is the Master Director. Golden State is getting older, and so is LeBron James. And players really want to come to Boston. That is fairly new. Present Celtics may elect to take lesser salaries to remain in Boston. So, the most successful decade? The 60's because of Auerbach, Russell and the winning environment that brought nine Titles. The most entertaining decade? The 70's. Cowens leaping out of the building for rebounds, Havlicek running opponents into the ground and Jo Jo firing no-arc, high-velocity rounds at the hoop. The most rewarding? The 2000's for the one Title that presented The Truth with a trophy. At times, he was the only bright light for fans in the 90's. The most talented? The 80's, particularly the 1985-86 team. It seemed that no team could beat them. At times, they toyed with opponents. 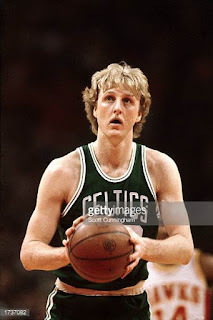 The eight-man rotation included Larry Bird, Robert Parish, Kevin McHale, Dennis Johnson, Danny Ainge, Bill Walton (healthy), Jerry Sichting and Scott Wedman. Quite a group. The present Celtics team is young and talented, and they have a great shot at eclipsing teams from past decades. They are as well-coached as any Boston Celtics team from the past. The defense is masterful, and the ball movement is exciting. And Kyrie Irving is one of the most fun players to observe in memory. That's it. Plenty of room for discussion and disagreement. What do the readers think?